Iago: Say, isn't it time for your Halloween trick? Jafar: [Jafar gets the hourglass again] Midnight nears. Kaa: [singing] You will forget about your troubles, put your trust in me. Mickey: [in Mickey's Mechanical House] The furniture folds right into the wall. Salesman: It makes a great shortcut into the hall. Maleficent: [singing] Every evil queen gets due respect. Goofy: [Minnie storms on-stage to confront the villains] Gosh. I've never seen her so mad. Aladdin: Here, use the lamp. Jafar: Take a hike, chickies. Cruella De Vil: Lights out. 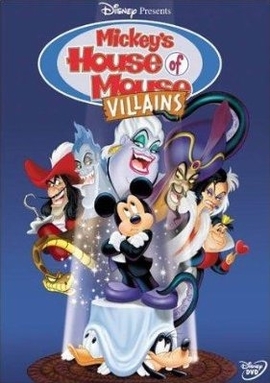 Cruella De Vil: Oh, Halloween at the House of Mouse, all treats and no tricks. Ursula: Add a splash of evil? Captain Hook: Pillage and Plunger? Iago: ...all talk and no play, what a bunch of dull villains. Jafar: I've got a trick for Mickey Mouse. But you'll have to wait till midnight. Goofy: [In "Lonesome Ghosts] Oh, I'm brave. Hu-yuck, but I'm careful. Mickey: Ok. Everybody, now it's time for a change of pace.